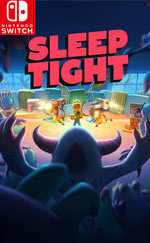 Sleep Tight​​ draws​ ​from​ ​shared​ ​childhood​ ​experiences​ ​to​ ​deliver​ ​a​ ​fast-paced​ ​twin-stick​ ​shooter that​ ​marries​ ​adrenaline-pumping​ ​action​ ​with​ ​a​ ​charming​ ​world​ ​wrapped​ ​in​ ​blankets​ ​of​ ​nostalgia. Build​ ​pillow​ ​forts​ ​during​ ​the​ ​day​ ​to​ ​prepare​ ​for​ ​hordes​ ​of​ ​monsters​ ​who​ ​emerge​ ​after​ ​dark.​ ​​Fight back​ ​against​ ​their​ ​relentless​ ​onslaught​ ​with ​dart​ ​Gatling​ ​guns,​ ​water​ ​balloon​ ​launchers,​ ​remote controlled​ ​gun​ ​turrets,​​ ​and​ ​other​ ​toys.​ ​​Throughout​ ​these​ ​frenetic​ ​nocturnal​ ​battles,​ ​players​ ​will collect​ ​stars​ ​from​ ​fallen​ ​enemies​ ​to​ ​upgrade​ ​their​ ​skills,​ ​buy​ ​power-ups,​ ​and​ ​unlock​ ​new weapons. 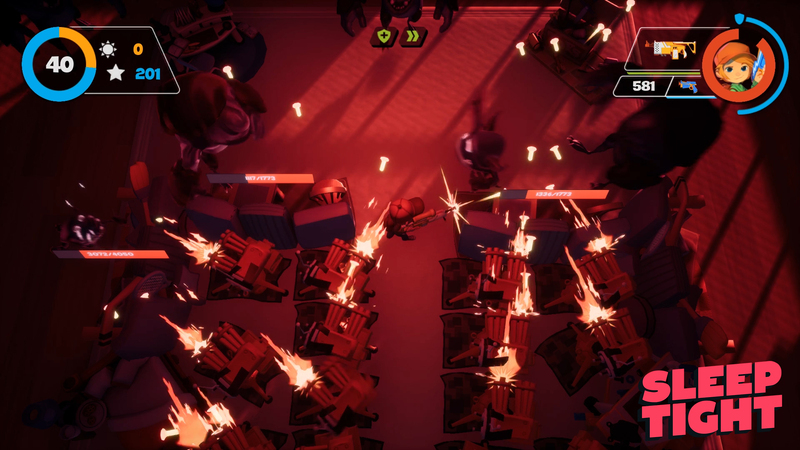 While looking at the whole package, Sleep Tight’s art style and gameplay make it stand out above other twin-stick survival shooters. While you aren’t getting a massive amount of content, you’ll still be able to have a ton of fun with the game. And at $14.99, I can absolutely recommend it for both fans of the survival genre and fans of the “cartoony” art style. 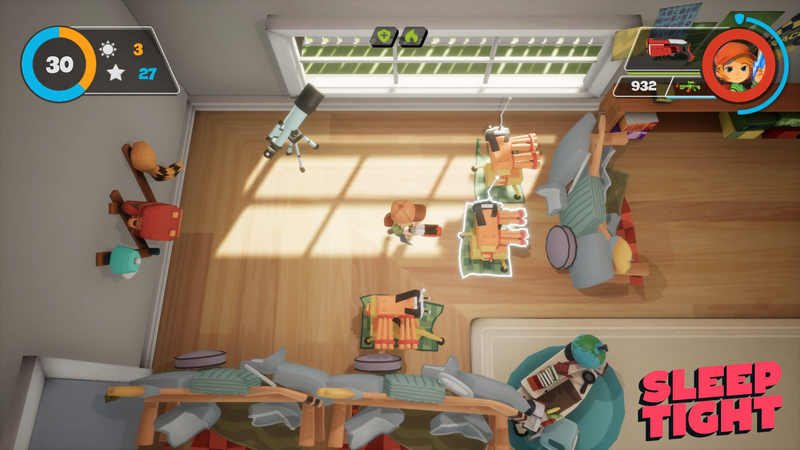 Overall, Sleep Tight is far from a perfect game, but it has enough potential to be enjoyable. Plenty of replay is in order to unlock all the characters you can play as. I do think its current price of $14.99 is too much, but if it goes on sale for $10 or less, it might be worth getting. All in all, Sleep Tight is a neat little package. It knows what it wants to do and it does most of it well enough, but it might not excite people who don't share the same nostalgia for the specific childhood experience described within it. Slightly above average or simply inoffensive. 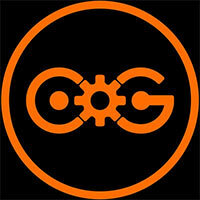 Fans of the genre should enjoy it a bit, but a fair few will be left unfulfilled. 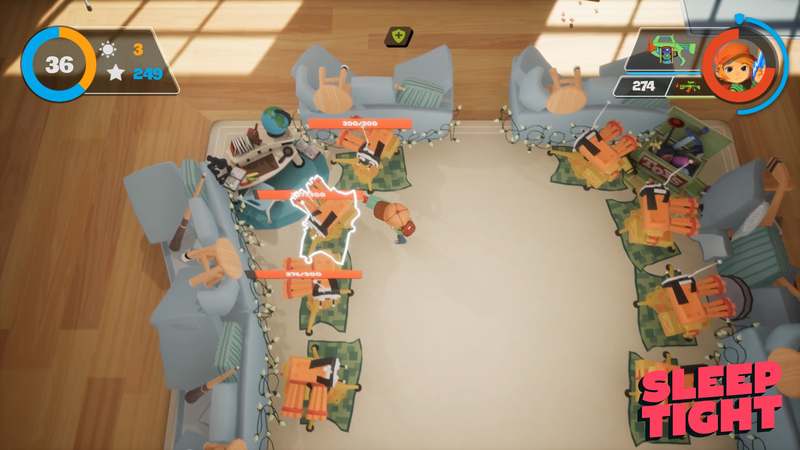 All together, Sleep Tight does what any tower defence/survival game should; it gives you a place to protect and the tools to do so, and does its best to keep you engaged. The issues really only pop up the longer you survive. At times, I would purposefully let myself die just so I could get a character unlocked and start over. 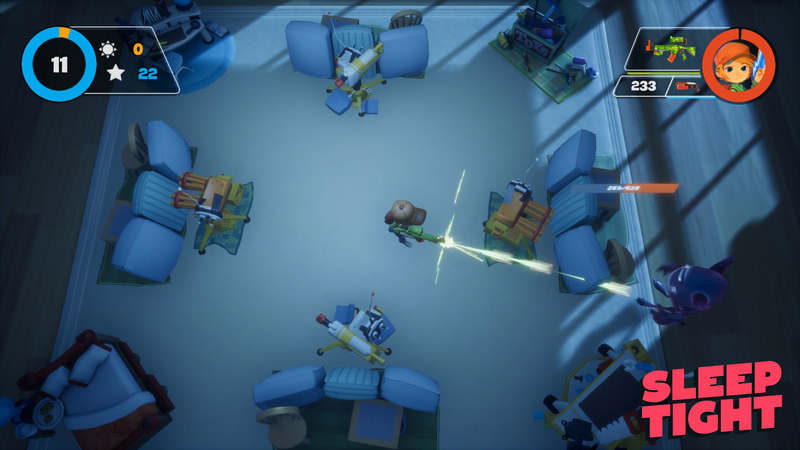 Sleep Tight is an enjoyable and surprisingly strategic twin-stick shooter that pulls you in the longer you play, however experiencing the same setting, enemies, and characters over and over makes this a game best played to kill an hour or so rather than to really engross yourself. The controls are smooth and the graphics look fantastic but it feels like it just needs more variety. 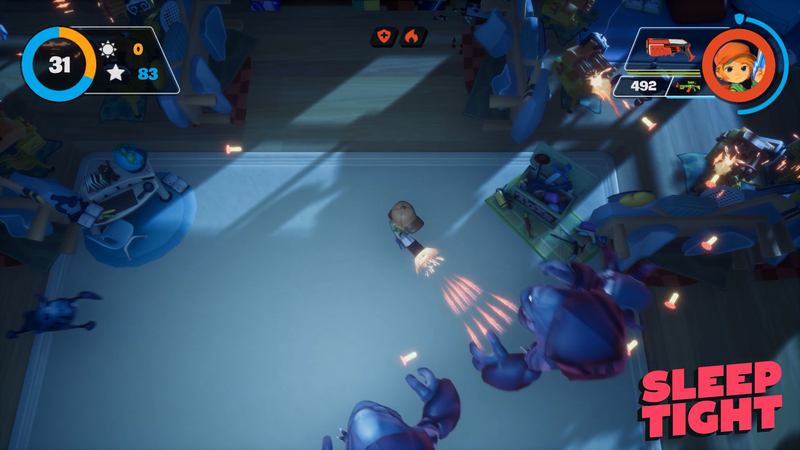 In a game heavily inspired by children’s imaginations, the repetition is surprisingly dull. Sleep Tight has some very interesting ideas, but unfortunately fails to captilise on them and falls into the depths of mediocrity. The stand out aspect of it is the economy and the ability to change the two currencies for each other, but without meaningful options around this it just feels hollow. 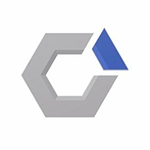 Add to this enemy AI that lacks nuance and simply rushes at you, the ability to predict what will happen is simply too much.